莱茵论坛 第148期 活动 – (中文)讲座 @杜塞 2018/09/08– 德国被动式建筑中国本土化探索及实践 | Rhine Academic Forum e.V. – Event no. 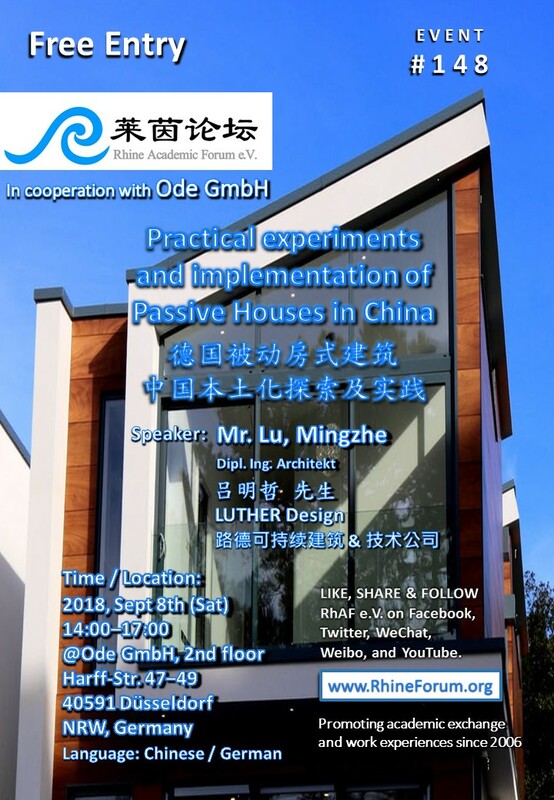 148 @Düsseldorf 2018/09/08 (Chinese/German): Practical experiments and implementation of Passive Houses in China – Rhine Academic Forum e.V. In 2008 Mr. Lu started to study Architecture and Urban Planning at HCU Hamburg. After graduation he worked in different European and German Architecture offices, incl. Zaha Hadid Architects, and Weinmiller Architects. Today Mr. Lu works at his own company Luther Design. The Rhine Academic Forum e.V. warmly welcomes you to join this presentation-event on Sat, 8th of September 2018, and hope to see you soon in Düsseldorf!